Can The Spread Offense Emergence In The NFL Help Michael Vick? The announcement came today that Michael Vick was released from prison after serving 19 months in jail on a dogfighting conviction in 2007. Vick will be serve two months of home confinement until July 20th, then will be able to 'get a job' in society. 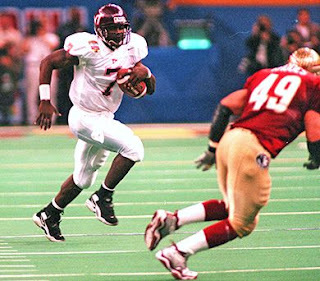 Being a fan of Big East football, I used to love watching Vick play for Virginia Tech with his athletic style of quarterback play. Is there a spot for Michael Vick with the 'Wild Cat' making its way into the NFL? Are his skill sets still there that would allow him to get into a shot-gun formation and run some single-wing 'run-pass' option football for an NFL franchise? Time will tell if this is the case, or if a team will take the chance on Vick and the negative publicity that will surround such a move. But then again, the young man 'did his time' for a crime he admits committing, no matter how wrong it was. By the way, I do see Martha Stewart back on the scene, doing well in the free market we call capitalism.